Based on these findings, URC founder John Gokongwei, Jr., having previously seen several ready-to-drink tea beverages during a trip to China, decided that it was time to introduce green tea to the local market. A major challenge in introducing C2 was the fact that Filipinos are generally not tea-drinkers; when they do drink tea, they normally want it very sweet. “That’s why our initial marketing efforts were centered on product education, “says Patricia Go. “All of our tri-media advertorials focused on giving information about green tea and its health benefits." The strategy proved highly effective and C2 Green Tea gained immediate public acceptance. 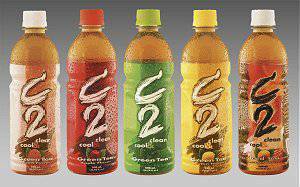 C2’s success emboldened URC to launch three variants of the product soon after—Green Tea Lemon, Green Tea Apple, and Green Tea Peach—all of which also did very well in the market. Since then, with the C2 brand hardly two years in the market, URC introduced even more variants of the product: C2 Lite in green tea plain and lemon, and C2 Fruit-Tea in strawberry, kiwi, lychee, and forest fruit flavors.